Darden bills itself as the “world’s largest full-service restaurant company,” operating 1,501 restaurants in the U.S. and Canada as of May 2014, including "837 Olive Garden, 464 LongHorn Steakhouse, 54 The Capital Grille, 52 Yard House, 38 Seasons 52, 37 Bahama Breeze, and 15 Eddie V's." This was down from 2,138 restaurants in 2013, largely due to the July 2014 sale of Red Lobster. Darden employs around 206,000 people, 196,000 of them hourly staff and served more than 400 million meals annually. Darden Restaurants trades on the New York Stock Exchange under DRI. Total sales in 2012 were $8.00 billion with $8.3 billion projected in 2013. 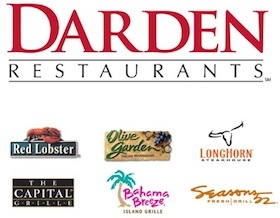 In 2014, total sales at Darden's remaining restaurants was about $6.29 billion. Darden's net income in 2014 was about $286 million, down significantly from $476 million in 2011. According to a report by Citizens for Tax Justice, which notes that "the federal corporate tax code ostensibly requires big corporations to pay a 35 percent corporate income tax rate," Darden's actual average tax rate from 2008-2010 was only 17 percent. Fox Business reported in 2013 that Darden "spends more on campaign contributions than any of its peers other than the far larger McDonald’s." In 2011, Darden was fined for underpaying its employees and violating the Fair Labor Standards Act’s minimum wage and record keeping provisions. Access Darden Restaurants' corporate rap sheet compiled and written by Good Jobs First here. 8.1 Former CEO Clarence Otis Jr. In 2013 and 2014, Barington Capital Group and Starboard Value, activist investors in Darden, brought pressure against the company on a number of issues. The two hedge funds had argued that the company was being poorly managed and called for it to be broken up. In December 2013 Howard Penney, a director at Hedgeye Risk Management focused on the restaurant industry, told Fox Business, "It may not be apparent to a lot of people but I think the writing is on the wall. The structure of the company will not exist a year from today." In its May 2014 SEC filing, Darden even named the "actions of activist shareholders" and the "potential proxy contest for the election of directors" as "risk factors" that could potentially harm its business. On May 16, 2014 Darden announced a plan to sell Red Lobster to Golden Gate Capital, an equity firm, for $2.1 billion. The New York Times described the deal as "perhaps the biggest rebuke so far to the activist investors, who have called for a more drastic breakup of the casual dining company. The deal does not require the approval of shareholders, making it unlikely that the disaffected hedge funds can stop the transaction." Darden planned to use $1 billion to pay down existing debt and an additional $700,000 to buy back stock. Representatives of Barington and Starboard complained that the price was too low, with Starboard executive Jeffrey Smith commenting "This board’s value-destructive and self-serving actions fly in the face of corporate democracy" and Barington CEO James Mitarotonda calling the deal a "fire sale." The sale was announced as completed on July 28, 2014. Also in July 2014, the Orlando Business Journal reported that Barington Capital Group had proposed the company split the roles of CEO and chair and pressed for naming an independent board chair. Barington wrote in its proposal, "We believe that the combination of the chairman and CEO roles in a single person weakens a company’s corporate governance, which can harm shareholder value." According to USA Today, Barington had repeatedly expressed concern about the company's "financial and operational performance" under Otis. ROC United, a non-profit organization that addresses workplace justice issues for restaurant workers, has said that "The activist investor strategy being pushed on Darden leadership follows the same asset-stripping playbook that has sunk other vulnerable restaurant chains." The group has advocated for Darden's 130,000 workers to "have a say in Darden’s future." On July 28, 2014 CEO Clarence Otis Jr. announced his resignation. He was replaced as chair by Charles Ledsinger Jr. At that time, Darden also announced that it would only nominate nine directors to the board instead of twelve, leaving three seats to be filled by Starboard. Three top-level executives pushed to resign in 2013 and 2014 each received generous "golden goodbyes" in the tens of millions of dollars. 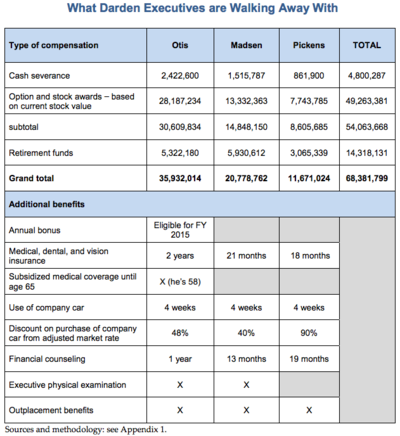 For former CEO Clarence Otis Jr., COO Andrew Madsen, and Chief Restaurant Operations Officer David Pickens, severance pay, awards, and accumulated retirement packages added up to $68 million, according to calculations made by the Institute for Policy Studies. As the Institute for Policy Studies pointed out, at least 20 percent of Darden's workers are paid only the federal minimum tipped-worker wage of $2.13 per hour. At that rate, it would take 8,110 years to earn the equivalent of Otis's "golden goodbye" package. Even at the median wage for tipped workers in the U.S., calculated at $10.22 by the Economic Policy Institute, a worker would have to put in 40 hours per week, 52 weeks per year, for 1690 years to earn the $35.9 million Otis was paid for resigning his job. In September 2014, Starboard published an internal shareholder document highly critical of Olive Garden's entire operation, laying out the hedge fund's alternative management plans, and asking shareholders to vote in favor of Starboard's leadership in the board. The report, in the form of a 300-slide PowerPoint presentation, was described by the Washington Post as "one of the longest activist slide presentations in recent memory," While a significant part of the report focused on food quality and a lack of "Italian authenticity" at the chain, Starboard also claimed that "Darden has massively underperformed peers" and complained of its "history of abysmal corporate governance" and " poor management and failed execution." Media coverage of the report highlighted its dismal assessment of Olive Garden's food, which Slate called "the mother of all food reviews" and described it as "tearing apart Darden Restaurants." As described by the Wall Street Journal, Starboard "spent several pages describing what it considered a lack of Italian heritage, criticizing a menu that had expanded to include Spanish tapas and burgers and a kitchen decision to stop salting the water for its pasta. Starboard also warned the company's management was wasting millions delivering more breadsticks than customers normally eat." Buzzfeed turned the presentation into a list of "16 Reasons One Hedge Fund Thinks Olive Garden Is Kind Of A Total Disaster," including menu items that "make no sense" and are not Italian, asparagus that is "too long," and slow service. Comedian John Oliver created a mock ad inspired by the report, finishing with the tagline, "When you're here... Why are you here?" However, as the New Yorker noted, "While the Olive Garden section of the presentation focusses on making meals more Italian, in part by using more traditional Italian ingredients, another portion of the plan urges Olive Garden to lower food costs. Though Starboard is sure that Darden can do both at once, the goals seem to be at odds with each other." Some of Starboard's suggestions would essentially raise profit margins by paying workers less. The hedge fund calls for "Delivering a better guest experience through enhanced labor," which would include "Chang[ing] the front-of-the-house service to rely more on tipped servers, less on higher-salaried or higher-wage bussers and food runners." The report also details Starboard's proposal to "create approximately $1 billion in shareholder value" by restructuring the company's real estate holdings. Starboard refers to Darden's ownership of the land and buildings its restaurants occupy as a "real estate opportunity," claiming that separating the real estate could "create ~$6 - $10 of value per share." Starboard's slideshow can be seen here. In response, Darden issued its own report defending its management, according to the Wall Street Journal. In its response, "Darden says it is focused on selling more wine, one of the bigger opportunities Starboard had pointed to last week in a nearly 300-page presentation. Darden also says it is cutting costs, planning to save $50 million on food costs and looking for more. Starboard said Darden could cut some $75 million in supply and food costs a year." Darden has fought hard against new laws and regulations on paid sick days policies, which would allow workers to stay at home when sick without risking their paycheck or their job. In Florida, Darden helped write and pass a bill that would ban local governments from requiring paid sick days for workers. Forty percent of all workers do not have paid sick days; existing federal law covers only employees working 25 hours or more at businesses with at least 50 workers, applies only to serious and not routine illnesses, and is unpaid. On February 12, 2015, the U.S. Equal Employment Opportunity Commission (EEOC) filed a lawsuit against Darden Restaurants, alleging the company had committed age discrimination in hiring at its Seasons 52 restaurants. The suit claims that Darden and four Florida affiliates violated the Age Discrimination in Employment Act by "disproportionately deny[ing] jobs at new Seasons 52 restaurants to applicants aged 40 and above," as described by Reuters. The complaint stated, "Defendants' hiring officials have told unsuccessful applicants in the protected age group that: 'you are too experienced'; 'we are looking for people with less experience'; 'we are not looking for old white guys'; 'we are looking for "fresh" employees'; and that Seasons 52 wanted a 'youthful' image." A spokesperson for Darden denied the allegations and indicated that Darden "will defend this claim vigorously." 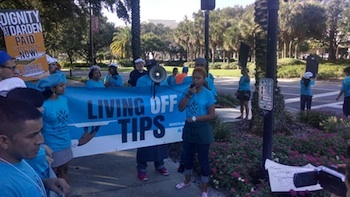 In January 2012, ROC United filed a class action suit on behalf of workers at Darden's Capital Grille in Chicago, New York City, and Washington, DC, alleging racial discrimination and violations of state and federal wage and hour laws. As of September 2014, the cases had been split into 5 separate jurisdictions, but were still pending. The Orlando Sentinel reported in October 2013 that Darden, along with some 40 other companies, was being investigated by the New York attorney general over its use of payroll debit cards to pay employees. The cards have come under fire for charging high user fees for things like ATM withdrawals, balance statements, and even inactivity. 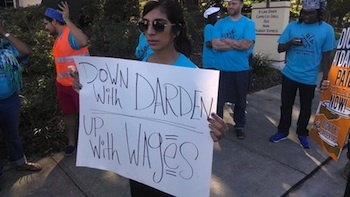 After a U.S. Department of Labor investigation of an Olive Garden in Mesquite, Texas found Darden hadn't paid workers for all their hours, Darden agreed to pay $25,000 in back pay and $30,800 in fines. Another investigation of a Red Lobster in Lubbock, Texas resulted in Darden paying $27,000 in back pay and $23,980 in fines, according to a report by the Corporate Research Project. 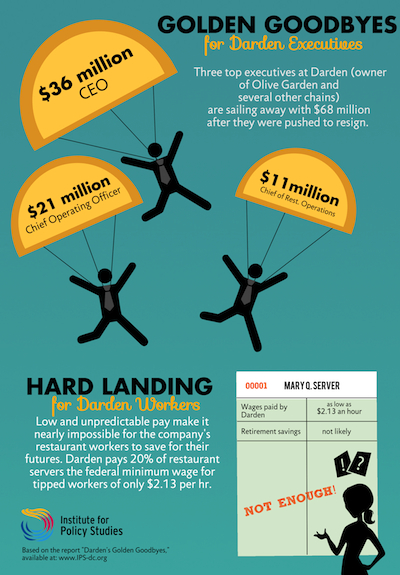 A report by the Corporate Research Project found that Darden had spent $4.7 million to settle three different wage and hour lawsuits in California, two of which alleged violations of state law for "requiring servers and bartenders to make up for cash shortages at the end of their shifts," and the third claiming multiple violations "including a failure to provide itemized wage statements and timely pay when an employee was terminated." According to a report by the Corporate Research Project, in 2005 Darden paid $9.5 million to settle a class action suit involving 20,000 current and former servers at Olive Garden and Red Lobster restaurants in California. The lawsuit claimed " that the restaurants violated state labor regulations by preventing workers from taking required breaks and by requiring them to purchase and maintain their uniforms." In December 2013, Fox Business reported that Darden "spends more on campaign contributions than any of its peers other than the far larger McDonald’s." According to the Corporate Research Project, "Until 2007 Darden spent less than $250,000 a year on federal lobbying. Beginning in 2008 that amount jumped to well over $1 million annually." According to Open Secrets, Darden spent $1,320,000 on lobbying in 2013, $1,280,000 in 2012, and $1,450,000 in 2011. It had spent $610,000 through July 2014. As of August 19, Darden had spent $610,350 on political contributions for the 2014 election cycle, with 45% going to Democrats and 54% to Republicans. The majority ($552,000) was given to PACs. Top individual recipients were Ron Wyden (D-OR), John Boehner (R-OH), Vernon Buchanan (R-FL), and Steny H. Hoyer (D-MD). Through the end of 2013, Influence Explorer reports that the Darden had spent $3,512,349 on political campaigns, with 66% going to Republicans and 29% going to Democrats. Top recipients included former U.S. Rep. Bill McCollum (R-Fl), former U.S. Rep. Ric Keller (R-Fl), former Sen. Connie Mack (R-Fl) (who now serves on the board of directors of Darden), and former Presidential candidate and Gov. Mitt Romney (R). The majority of NRA PAC contributions (90%) go to federal entities. Top PAC recipients include: Republican Party of Florida, National Republican Senatorial Committee, and the National Republican Congressional Committee. "Such subsidies—in the form of business property tax abatements, corporate income tax credits, sales tax exemptions, training grants, infrastructure improvements and the like—are supposed to promote job creation and broad-based economic growth. Yet they are often awarded to profitable, growing companies that do not need tax breaks to finance a project, meaning that the subsidies serve mainly to increase profits. When these companies are owned in whole or substantial part by wealthy individuals or families—true of many large U.S. corporations—the subsidies are serving to enlarge those private fortunes: directly in privately held firms or through stock price appreciation and dividends in publicly traded ones." Darden had been a member of the ALEC corporate board as of 2010. In April 2013 Darden spokesperson Rich Jeffers confirmed that the company cut ties with ALEC in January 2010 in order to allocate more resources to organizational connections like its involvement with the National Restaurant Association (which, like ALEC, has lobbied to override local paid sick day ordinances). Please see Corporations that Have Cut Ties to ALEC for more. Robert McAdam, who was hired in 2006 as Darden’s head of government affairs, was on the board of ALEC from 2008 to 2010. In 1992, McAdam worked at the Tobacco Institute and attended an ALEC meeting in Colorado Springs. McAdam was elected to the board of directors of the National Restaurant Association (NRA) in 2011. In its lobbying disclosure, the NRA lists Darden as one of its national corporate members, and the NRA gave Darden a diversity award in 2007. In 2008, then-Darden CEO Clarence Otis Jr. addressed members at the NRA annual meeting on public affairs. At Walmart in the mid 2000s, McAdam ran the war room, which was created to counter criticism from small business owners and unions. McAdam told the NY Times that Wal-Mart "has to run a campaign.” He added, “It's simply nonsense for us to let some of these attacks go without a response." The war room was a departure from prior policies, as Wal-Mart has traditionally spent little on public relations. McAdam’s biography at Darden mentions that he was an employee at the public relations firm Fleishman-Hillard, with industry associations, and was formerly a staffer in the U.S. House of Representatives. His biography makes no mention of his work at the Tobacco Institute, where he ran their states activities, meaning his job was to beat back taxes and regulations on tobacco. There are over 400 files in the Legacy Tobacco Documents that list his name. Activists in NY work on successful paid sick days campaign, 2012. Credit: Marcy Franklin. Other firms may offer competitive products and services, but Great Place to Work has no competitors. No other organization shares our unique social mission. Others may help companies make marginal improvements in their workplaces, but we endeavor to help organizations transform their cultures. Great workplaces are qualitatively different because of the impact of trust on workplace relationships. We believe in changing the quality of work life for all employees throughout the world. As pioneers of this social movement, we encourage all those who wish to create their own great workplaces. Like us, they wish to build a better society for all employees everywhere. The Institute’s website does not list prices for services, nor does it identify Darden as a customer. However, Otis was listed as a speaker at the Institute’s conference in Atlanta, GA, in March 2012. 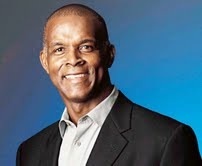 Former CEO Clarence Otis Jr.
Clarence Otis Jr. was Darden’s CEO from 2004 to 2014 and Chairman of the Board from 2005 to 2014. His total compensation for 2014, his final year as CEO, was $6,980,147, including $1,204,512 base salary and $4,612,995 in stock and options. Otis announced his resignation as CEO and chair on July 28, 2014. According to the Orlando Business Journal, investors had been calling for his resignation for several months. At that time, the roles of CEO and chair were separated and Charles Ledsinger, Jr. was appointed independent chair. Otis grew up in Watts, a poor, predominantly African-American section of Los Angeles. He graduated from Stanford Law and practiced in securities before moving into finance. He joined Darden in 1995, became CEO in 2004, and Chairman of the Board of Directors in 2005. Otis is married to Jacqueline Bradley, a former banking executive at Sun Trust. In the Orlando area, Otis has served on the boards of the Association to Preserve the Eatonville Community, The Metro Orlando Economic Development Commission, VF Corporation, Verizon Communications, Inc., the Federal Reserve Bank of Atlanta, and the Central Florida YMCA. He is an honorary member of the Mennello Museum of American Art. Otis is a speaker for Celebrity Talent Promotions, where he is categorized on their website as a business speaker and CEO. In November 2011, he gave a talk at the Emory University business school on corporate social responsibility. Regulatory mandates flowing from federal health care reform may be the most visible, but the list also includes measures such as new mandatory paid leave provisions that require us to change the way we accommodate employees who need to take time off when they are ill and ever more unrealistic requirements regarding employee meal and rest breaks that, in California for example, force our employees to take breaks in the middle of serving lunch or dinner. This reality is the result of the best intentions. Policymakers working in silos at every level are pushing through regulations that on their face seem to address admirable goals -- that are each directed at outcomes that seem desirable. The cumulative effect of these regulations, however, is significant damage to the hard-working Americans who are the intended beneficiaries. Charles A. Ledsinger Jr., Chairman of the Board as of September 2014. Chairman of Realty Investment Company, Inc., a private operating and investment company. Chairman of Sunburst Hospitality Corporation, a private hotel and real estate operator. Retired Vice Chairman and Chief Executive Officer of Choice Hotels International, a lodging franchisor. Michael W. Barnes, Chief Executive Officer of Signet Jewelers Limited, a specialty retail jeweler. Dr. Leonard L. Berry, Presidential Professor for Teaching Excellence, Distinguished Professor of Marketing, and M.B. Zale Chair in Retailing and Marketing Leadership, Mays Business School, Texas A&M University. Christopher J. (CJ) Fraleigh, Chairman and Chief Executive Officer of Shearer’s Foods, Inc., a global snack food company. Victoria D. Harker Chief Financial Officer of Gannett Co., Inc., an international media and marketing solutions company. David H. Hughes Retired Chairman of the Board of Hughes Supply, Inc., a building supply company. William M. Lewis Jr. Managing Director and Co-Chairman of Investment Banking for Lazard Ltd., an investment banking firm. Connie Mack III (legal name: Cornelius McGillicuddy, III), Partner and senior policy advisor for Liberty Partners Group, a public policy consulting firm. Former U.S. Senator. Michael D. Rose, Private investor and Chairman of the Board of Midaro Investments, Inc., a privately held investment firm. Maria A. Sastre, President and Chief Operating Officer of Signature Flight Support Corporation, a fixed based operation and distribution network for business aviation services. William S. Simon, Executive Vice President of Wal-Mart Stores, Inc., a global retailer, and President and Chief Executive Officer of Walmart U.S.
Brendan Fischer, Efforts to Deliver "Kill Shot" to Paid Sick Leave Tied to ALEC, April 3, 2013. Mary Bottari, The "Other NRA," the National Restaurant Association, Pushes Preemption of Paid Sick Days, July 24, 2013. Rebekah Wilce, Darden Restaurants Dumps ALEC in Favor of ALEC-Affiliated Group, April 15, 2013. Philip Mattera, Darden Restaurants: Corporate Rap Sheet, January 17, 2014. ↑ 1.0 1.1 1.2 1.3 1.4 1.5 Darden Restaurants, Form 10-K, SEC filing, May 25, 2014. Accessed September 9, 2014. ↑ 2.0 2.1 Darden Restaurants Inc., Form 10-K, 2013. ↑ Bloomberg Businessweek, Darden Restaurants, Inc., company profile, accessed September 9, 2014. ↑ Robert J. McIntyre et al, "Corporate Taxpayers & Corporate Tax Dodgers 2008-10," Citizens for Tax Justice and the Institute on Taxation and Economic Policy, November 2011. Accessed September 16, 2014. ↑ 6.0 6.1 6.2 Matt Egan, "Darden's Political Spending Raises Eyebrows," Fox Business, December 10, 2013. Accessed September 9, 2014. ↑ Sandra Pedicini, Darden fined by feds over Olive Garden, Orlando Sentinel, April 24, 2011. ↑ 8.0 8.1 8.2 8.3 8.4 Sarah Anderson, "Darden's Golden Goodbyes," Institute for Policy Studies, October 1, 2014. Accessed October 1, 2014. ↑ 9.0 9.1 9.2 Michael J. de la Merced, "Darden to Sell Red Lobster in a $2.1 Billion Dea," New York Times, May 16, 2014. Accessed September 9, 2014. ↑ 10.0 10.1 Michael J. de la Merced, "With Sale of Red Lobster Complete, Chief of Darden Restaurants to Step Down," New York Times, July 28, 2014. Accessed September 9, 2014. ↑ Darden Restaurants, Darden Completes Sale Of Red Lobster To Golden Gate Capital, corporate press release, July 28, 2014. ↑ Anjali Fluker, "Clarence Otis’ fate rests in hands of Darden shareholders," Orlando Business Journal, July 8, 2014. Accessed September 9, 2014. ↑ Roger Yu, "Darden CEO Clarence Otis stepping down," USA Today, July 28, 2014. Accessed September 9, 2014. ↑ ROC United, "Darden Workers Demand Seat at the Table During Uncertain Times for World’s Largest Full Service Restaurant Company," press release, August 12, 2014. Accessed September 9, 2014. ↑ 15.0 15.1 Anjali Fluker, "Breaking: Darden’s Clarence Otis resigns as chairman and CEO, new independent chairman named," Orlando Business Journal, July 28, 2014. Accessed September 9, 2014. ↑ Sylvia Allegretto and David Cooper, "Waiting for Change," Economic Policy Institute, July 10, 2014. Accessed October 1, 2014. ↑ 17.0 17.1 17.2 17.3 Starboard Value LP, "Transforming Darden Restaurants," shareholder presentation, September 11, 2014. Accessed September 17, 2014. ↑ David Benoit, "Starboard’s Olive Garden Slides: Salting the Water, Custom Straws and More," Washington Post, September 12, 2014. Accessed September 17, 2014. ↑ Jordan Weissman, " Olive Garden Has Been Committing a Culinary Crime Against Humanity," Slate, September 12, 2014. Accessed September 17, 2014. ↑ 20.0 20.1 David Benoit, "Darden, Starboard Tussle Over Dough," Wall Street Journal, September 15, 2014. Accessed September 23, 2014. ↑ Mariah Summers, "16 Reasons One Hedge Fund Thinks Olive Garden Is Kind Of A Total Disaster," Buzzfeed, September 12, 2014. Accessed September 23, 2014. ↑ Vauhini Vara, "What’s the Deal with Olive Garden?," New Yorker, September 15, 2014. Accessed September 23, 2014. ↑ Ashley Lopez, Florida Senate May Consider House’s More Restrictive Anti-Sick Pay Bill, Florida Center for Investigative Reporting, April 25, 2013. ↑ Aaron Deslatte, Senate waters down Orange-inspired sick-leave bill, removes 'living wage' preemption, Orlando Sentinel, April 25, 2013. ↑ Esmé E. Deprez, Coughing Cooks Stay Home as U.S. Cities Require Paid Sick Leave, Bloomberg, March, 21, 2013. ↑ Jonathan Stempel, "U.S. agency claims Darden won't hire 'old white guys' for dining chain," Reuters, February 12, 2015. ↑ ROC United, "ROC LAUNCHES NAT’L CAMPAIGN FOR DIGNITY AT CAPITAL GRILLE, RED LOBSTER, OLIVE GARDEN!," press release, January 31, 2012. Accessed September 9, 2014. ↑ Dignity at Darden, Litigation, organizational website, accessed September 9, 2014. ↑ Sandra Pedicini, "More companies opt to give workers payroll debit cards," Orlando Sentinel, October 6, 2013. Accessed September 9, 2014. ↑ Jessica Silver-Greenberg and Stephanie Clifford, "Paid via Card, Workers Feel Sting of Fees," New York Times, July 1, 2013. Accessed September 9, 2014. ↑ 31.0 31.1 31.2 31.3 31.4 31.5 Philip Mattera, "Darden Restaurants: Corporate Rap Sheet," Corporate Research Project, accessed September 9, 2014. ↑ Darden Restaurants: Summary, Opensecrets.org, September 9, 2014. ↑ Center for Responsive Politics, Darden Political Spending, 2014, Open Secrets, accessed September 9, 2014. ↑ Center for Responsive Politics, Darden Recipients, 2014, Open Secrets, accessed September 9, 2014. ↑ Darden Restaurants, Influence Explorer, September, 2013. ↑ Philip Mattera, Kasia Tarczynska and Greg LeRoy, "Tax Breaks and Inequality Enriching Billionaires and Low-Road Employers in the Name of Economic Development," Good Jobs First, December 2014. Accessed January 5, 2015. ↑ Rich Jeffers, Director of Media Relations, Darden Restaurants, telephone conversation with the Center for Media and Democracy, April 11, 2013. ↑ Rebekah Wilce, Darden Restaurants Dumps ALEC in Favor of ALEC-Affiliated Group, PRWatch.org, September, 2013. ↑ Brendan Fischer and Mary Bottari, Efforts to Deliver "Kill Shot" to Paid Sick Leave Tied to ALEC, PRWatch.org, April 3, 2013. ↑ Private Enterprise Board, ALEC.org, September, 2013. ↑ The Tobacco Institute, University of California, San Francisco. ↑ National Restaurant Association, "http://www.restaurant.org/Pressroom/Press-Releases/National-Restaurant-Association-Elects-New-Members National Restaurant Association Elects New Members to Serve on Board of Directors]," press release, June 13, 2011. Accessed September 9, 2014. ↑ National Restaurant Association website, September, 2013. ↑ National Restaurant Association Pressroom, September, 2013. ↑ National Restaurant Association Announces Speakers for 2008 Public Affairs Conference, September, 2013. ↑ Robert S. McAdam bio, Darden website, Accessed September 2013. ↑ Michael Barbaro, A New Weapon for Wal-Mart: A War Room , The New York Times, November 1, 2005. ↑ Legacy Tobacco Documents, University of California, San Francisco. ↑ 50.0 50.1 Robert Levering and Milton Moskowitz , [http://money.cnn.com/magazines/fortune/best-companies/2012/faq/index.html 100 Best Companies to Work For], CNNMoney.com, Accessed September, 2013. ↑ Our History - A Quarter-Century Legacy, GreatPlacetoWork.com, Accessed September, 2013. ↑ Why We Do What We Do, GreatPlacetoWork.com, Accessed September, 2013. ↑ 2012 Conference Presentations, GreatPlacetoWork.com, Accessed September, 2013. ↑ 54.0 54.1 Darden Restaurants, Proxy Statement, SEC filing, September 9, 2014. ↑ 55.0 55.1 Mark Chediak, Darden chief Clarence Otis is active in the Orlando-area business and arts community, Orlando Sentinel, November 2, 2008. ↑ Sarah Hale Meitner, New Ceo Sits At Head Of Darden Table, Orlando Sentinel, December 26, 2004. ↑ Darden Restaurants CEO Clarence Otis Jr. has a lot on his plate, Restaurant Magazine, Accessed September, 2013. ↑ Clarence Otis Speaker, Celebrity Talent Promotions, Accessed September, 2013. ↑ Goizueta Newsroom, Otis Talks Corporate Social Responsibility, Emory Goizueta Business School, November 4, 2011. ↑ 61.0 61.1 Clarence Otis Jr., What's stopping job creation? Too much regulation, CNN, December 6, 2011. ↑ Darden Restaurants, Executive Members, organizational website, accessed September 9, 2014. This page was last edited on 11 October 2017, at 19:24.